With large amounts of water, there are several problems that can occur with both the base oil and additives. 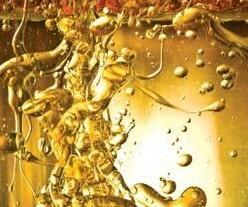 For the base oil, your main concern should be excessive oxidation caused by the catalytic effects of water. To test for this, you may want to run either an acid number or FTIR oxidation test to determine to what extent the base oil has oxidized. Remember to run these two tests on both the used oil and a fresh new oil sample to allow a differential comparison of the test results. As for additives, your main focus should be on the corrosion and oxidation inhibitors and the demulsifying additives. To test the corrosion prevention characteristics of the oil, you may want to run the ASTM rust inhibition test (ASTM D665). The antioxidant additives can be tested using the RPVOT test (ASTM D2272) used to measure the oxidation stability of steam turbine oil. A low RPVOT value relative to the new oil may indicate significant antioxidant depletion. Another good test is linear sweep voltammetry for aminic and phenolic inhibitors (ASTM D6810 & D6971). To determine if the demulsifying additive has been appreciably destroyed, you may want to run the standard test method to determine the demulsibility characteristics of the oil (ASTM D1401), which seeks to determine how quickly the oil will shed water at elevated temperatures.